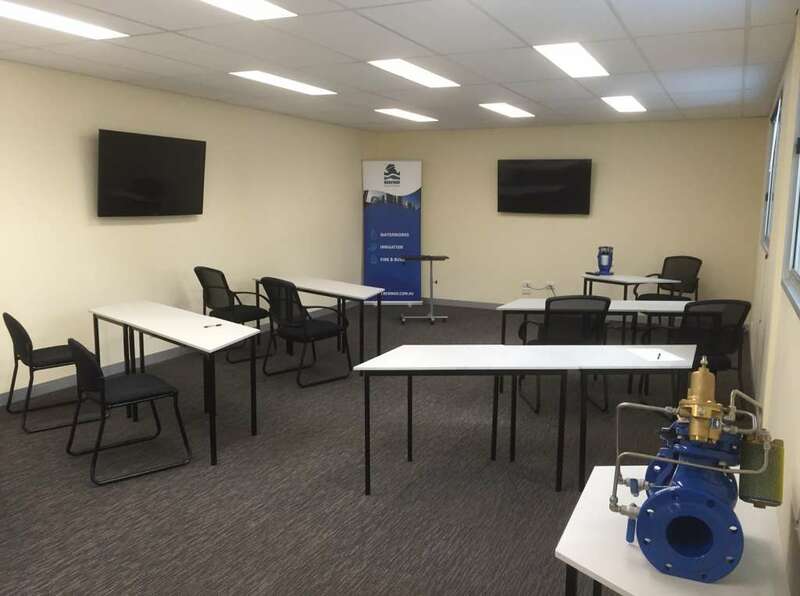 Since Bermad’s move to our new Thomastown office – we’ve made some improvements to our training centre and testing facility. We’ve set up a space that enables us to cover more of our product range for industry professionals. A purpose-built classroom is now part of the testing facility, enabling a hands-on session that incorporates theory and practical observation. Our team can train up to 16 individuals at a time in our classroom and test rig. The testing facility incorporates control valves, meters and Magflows – as well as Australia’s first air valve testing bench. The Bermad Training Academy offers demonstrations of air release valves and their performance under simulated conditions. Valves can showcase their ability to seal under varying pressure and flow conditions. Our dynamic air flow bench is able to demonstrate air flow performance under vacuum and discharge air flow. This contributes to improved practical design understanding and knowledge. If you wish to attend a session at the Bermad Training Academy and testing facility, please don’t hesitate to contact your local sales office.